On a recent holiday I had this lovely peppers and pear salad at a hotel. I didn’t ask the Chef for the recipe, assuming that I’d find it on the internet. When I got home and searched for it, I didn’t have any luck. So taking a guess at the ingredients, I came up with this and I must say it tastes much the same. So if you’re looking for a healthy, colorful, crunchy salad here’s the recipe. Julienne the peppers and the pears. Heat the oil on medium flame. Add the pears and cook for about 5 minutes on low heat till they soften. Add the balsamic vinegar and Tabasco sauce. 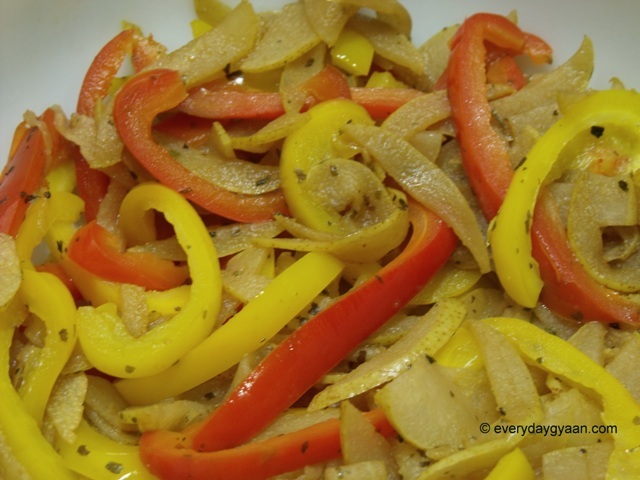 Add the peppers and stir fry for about 3 mins (you don’t want the color of the peppers to change). Sprinkle with parsley and salt and you’re ready to go! This serves two if you eat loads of salad like we do. We had this last night with a chicken roast (another recipe I’ll share with you soon) and it was great! Do let me know if you try it out and ask me for clarifications, if you need them. This would be great to try 🙂 but I do need to ask my mom if she’d like the idea otherwise, I’ll eat everything up. I also saw the answer to my question regarding tabasco sauce, yey! How about leaving the fruit and peppers raw? I prefer the crunchy textures. Do you think it would taste good? And, adding some crumbled cottage cheese might give it a protein boost too. I am just thinking aloud :). I think if you like them raw, that would be fine too. However, I think the pears soak up the vinegar better when they’re being coooked. I would suggest you cook it for a very short time. Crumbled cottage cheese seems like a good add. Let me know how it turns out. You lost me at the vinegar and Tabasco sauce Corinne! But I love bell peppers and pears. Glad you were able to make your own. Does that mean you don’t use vinegar and Tabasco sauce, Adrienne? Perhaps some lemon and chilli flakes would work as well. Nope, not at all AND I don’t like lemon or chill either. I know, I’m weird… Guess that’s why I’m not much of a cook. I must try out the one with apples, Harleena. Which variety did you use? I must share another recipe soon – apples and cabbage salad – very yummy! I’ve started to use green apples in salads and I love them! Hope it turns out well – let me know, Vinita. I’ve also tried out a similar recipe, though have tried it out with apples instead of pear and it did come out wonderful indeed. Looks tempting given the fact that I simply love pears! I love pears too. Have you tried stewed pears as a dessert? Tell me how the salad turns out. I would love to know how it turned out, Sulekha and what you had it with. We are salad people but while I like all kinds — and this one sounds and looks very yummy — the L&M prefers raw salads which he can munch on. Can one do this without the tabasco sauce? I don’t stock up on too many sauces. Yes I think the tabasco sauce can be substituted with chilli flakes or add jalepenos if you have some. Let me know what you decide and how it turns out, Zephyr. If you do try it, let me know how it turns out, Jocelyn. I have tried a similar recipe, though with apple instead of pear, and that tastes wonderful indeed. Would try out your version and let you know about it. So you have to re-comment, Harleena. Your comments went to spam 🙁 I appreciate the effort – thank you very much. Sounds like a great recipe, Corinne. Unfortunately, I don’t have any pear right now (I had some last week, but finished all of it). How about some peach? (Pepper and peach, is that a great combination? I don’t know, peaches are too sweet). I will certainly try this the next time I buy some peach. Note: I just learned that you live in Mumbai. How is everything over there? I’m not sure how the peppers will go with peaches, @jeevanjacobjohn:disqus, but if you do try it out, let me know how it works out! Yes, I’m based in Mumbai – I guess you’re asking about the riot recently? It was confined to one place and didn’t really affect us. Do you have family in India still? I moved to US, along with my family, 4 years back. So, yes I do have contact. I started cooking only five years ago and stick to the simple stuff – let me know if you want any recipes. Moving to the US must have been a big move for the family. Hope that’s working out well for you all. Where did you live in the US? Good, good! I came by your blog yesterday but haven’t commented yet. Will visit again today and do some catching up on your latest posts. There aren’t many people who don’t love a quick, easy recipe ☺ I can’t wait to give it a try…have to grab a few pears from the market first LOL. Thanks so much for sharing with us this week in our linky. I must add the link here, @google-fa6d60ae2d8167c683aa10d45de3d03f:disqus. I was meaning to ask you if the salad was something Michaela could eat. Let me know how it turns out. Sounds delicious, Corinne! We will definitely have to try this one out! Blessings! Do let me know how it turns out, @da4c5f50dbbc90e23e83ef145d0c537b:disqus.